Bachelor “winner” Emily Maynard drug out a long dumping of Brad Womack and man, we were all so happy and relieved to see that one finally come to an end. I have never been so irritated by a relationship from the show as I was with that one. Anyhow, the Southern Belle has moved on with a much bigger man…. an NFL star. 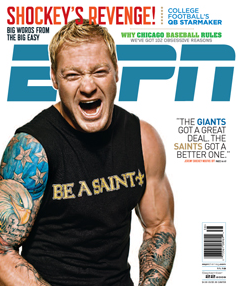 Carolina Panthers tight end, Jeremy Shockey. He earned his reputation with the New York Giants and New Orleans Saints, but is now conveniently close to Emily in North Carolina now. Yeah, I think that Emily likes the fame and is trying to milk it now. I highly doubt that she’ll get serious with Shockey. She will probably go through a string of celebrity type guys… she’s only 25 and has a lot of “game” left in her.